We know that Coursera learners are fitting coursework into full, busy lives. We’ve been touched by your stories of building new skills while juggling work, family, and other commitments, and we’re constantly looking for ways to help you achieve your goals. This week, as part of that effort, we launched a new set of progress tracking and planning features for your course dashboard and home pages. In developing these features, we drew inspiration from everything from fitness trackers to financial planning apps, as well as from tools used in community colleges and other programs that cater to busy, working adults. We found that the most successful products allowed users to track and visualize their progress, and made it easy to identify the next step toward a specific goal. On your course dashboard, where you can find all of your courses, you’ll now see a simple progress bar for every course in which you’re actively working toward a Course Certificate. 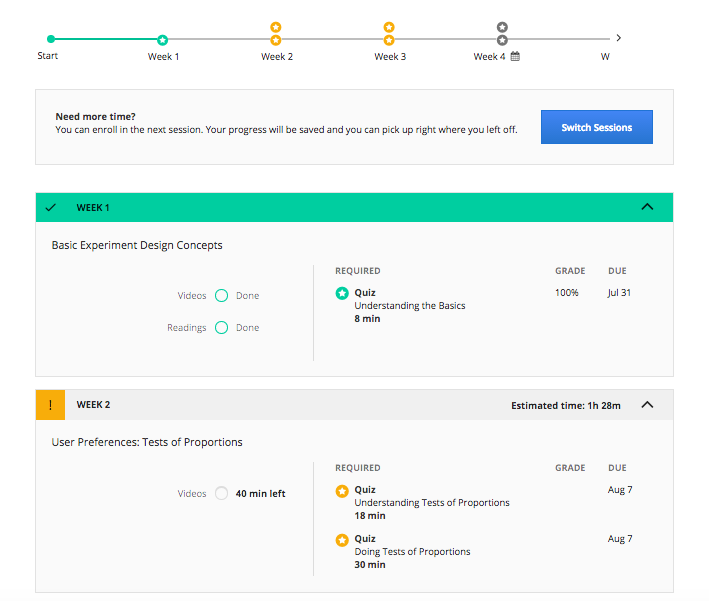 A second progress bar appears on your course home pages, along with a detailed week-by-week summary of the content and assignments that you need to complete each week. We’ve highlighted the video lecture, reading, or assignment that we recommend you complete next on both your course dashboard and course home page. You can jump straight to that item by clicking the “Start” button. The “next step” feature will most often send you straight to wherever you last left off in the course. Occasionally, however, you’ll be directed back to re-attempt an assignment that you didn’t pass on the first try, or forward to start practicing new skills on the next assignment to come. Of course, you can still navigate to any item in the course outline from the course home page. Since we began testing these new features a few months ago, we’ve seen promising results. Our early data suggests that learners who have access to these features are over 10 percent more likely to complete a course successfully overall. Learners who are on track to complete tend to do so more quickly, and when a learner does fall behind, he or she is about 11 percent more likely to catch up and to ultimately finish the course successfully. We can’t wait to see how you use these features, and what you achieve! If you have questions or suggestions about progress tracking, next steps, or anything else on Coursera, please visit our Help Center to learn more or contact our team.